Meadow parsnip, Thaspium trifoliatum, is a challenging species to identify. 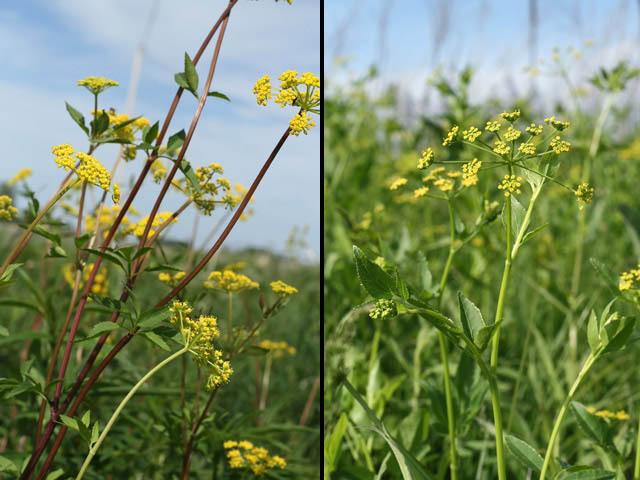 It’s remarkably similar to another, more common, prairie plant that also is a medium-sized, yellow-flowered, spring-flowering member of the carrot family (Apiaceae), the lovely golden Alexanders, Zizia aurea. Nowadays, all plant families name start with the prominent genus in that family and end in “-aceae” (pronounded “ai-seh-ee”). Older books, however, designated a few families by names that don’t have “-aceae” endings. There are 8 of them, mostly very large families with some singular distinctive trait. People (old people, anyhow) still refer to “crucifers” in reference to the traditional name of the mustard family, Cruciferae (nowadays called Brassicaceae), and “composites” for the aster family, Asteraceae. Claridon Railroad Prairie is a diverse prairie remnant of the Sandusky Plains. The prairie is one mile long and 50 feet wide, situated between an active CSX railroad track and a little-used county Road in Marion County, OH. It was the inspiration and primary seed source for the Larry R. Yoder Prairie, a prairie restoration at OSU’s Marion Campus. Both similar umbelliferous species occur at Claridon, and they are flowering now. Both diagnostic traits can be discerned when the plants are either flowering or fruiting, although the ovary-is-winged feature, subtle in flower, is very conspicuous in fruit. The central flower, and only the central flower, of Zizia is sessile (stalkless), while all the flowers of Thaspium are stalked. Note also the prominently winged ovary (lower portion of epigynous flowers such as these) is winged in the Thaspium. Zizia is on the left and Thaspium is on the right. A few flowers were cut off from the foreground region of each cluster to reveal the central flowers. There’s a massive display of white blue-eyed grass at the west end of the prairie. This species, Sisyrinchium albidum (family Iridaceae) was noted two weeks ago at the Marion Campus Prairie, where only one plant was seen and it had a distinct bluish cast to the flowers. Flower color can vary, and albino forms of many plants that are normally pink or blue-flowered occur now and then. 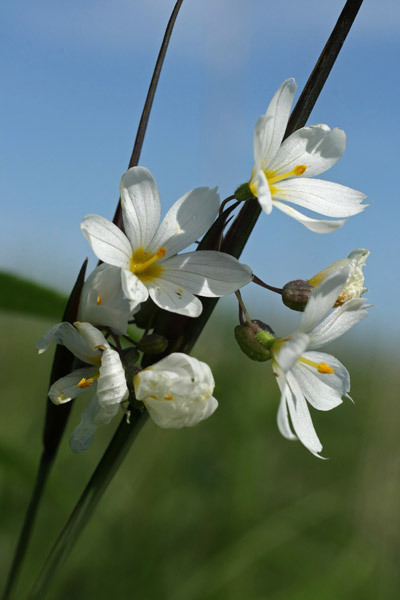 This raised the question, “Are you sure this is white blue-eyed grass and not just a nearly albino form of a more common species?” (S. angustifolium is the common Ohio species of blue-eyed grass.) Generally when similar species differ by flower color, there are other differences as well, and that’s true in this case: E. Lucy Braun in Monocots of Ohio tell us that S. albidum spathes (paired leaf-like appendages from which the flowers arise) are stalkless, whereas the spathes of S. angustifolium are stalked. 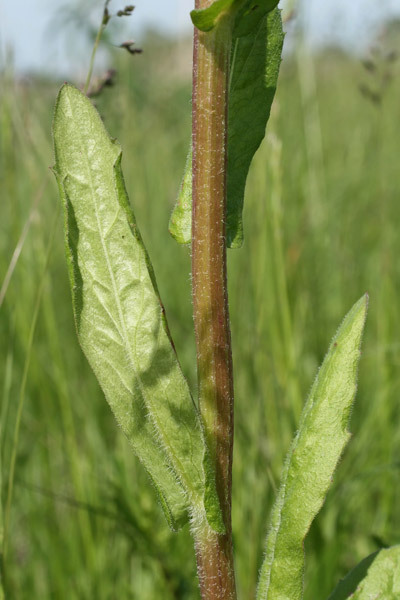 She also mentions that the flowers of S. albidum, which are normally white, can also be blue. That would be “blue white blue-eyed grass”! Sisyrinchium albidum (family Iridaceae), Claridon Railroad Prairie, Marion County, OH, May 30, 2008. 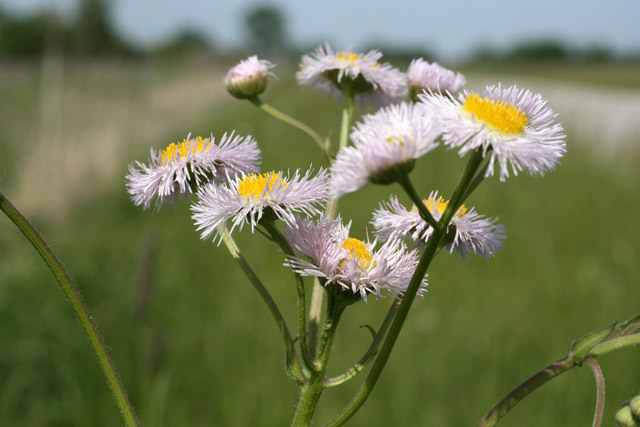 The fleabanes (genus Erigeron in the family Asteraceae) are native annuals, biennials or short-lived perennials. They resemble asters (Symphyotrichum) but are generally spring-flowering whereas the asters bloom in late summer and fall. I’m not sure of the species, but I think that the one with clasping leaves, which this seems to have, is the Philadelphia fleabane, Erigeron philadelphicus.